We’re big believers in digital arts and the use of technology across different art forms but as technology becomes more powerful, the prospect of using it creatively might seem a daunting one. Digital influences are appearing more and more in Arts Award projects and, with this in mind, we’ve come up with five ways to get started in the digital arts world. Digital art doesn’t require you to produce something from scratch entirely using technology. It could involve altering an existing piece or combining tech with another art form. Consider how an art form you work in already could incorporate digital elements; this could be as straightforward as displaying your art online, or as complex as altering the work itself. Why not use an app to edit photographs on your phone? Maybe take footage from a music, drama or dance performance and turn it into a gif that can be easily shared on social media? If you work on English or Drama projects, perhaps expand the work on narrative and storytelling to make use of interactive visual novels , there are some great free examples readily available through sites such as itch.io. As mentioned earlier, digital arts are becoming increasingly common and this means they are even easier to access through a range of arts and cultural organisations. You might not be in a position to include technology in your own creative offer but be sure to look into any nearby opportunities and make use of outside expertise. For instance, we’ve written before about how museums and galleries use technology, particularly when it comes to making collections available to view online. Another example is the band OK Go, who are well-known for their elaborate music videos. Their site, okgosandbox.org, delves into how these are made, breaking down techniques used behind a selection of their videos and how young people can replicate them. Arguably the most visible digital artform is videogames and if you work with young people there’s a strong chance that it’s a medium they engage in already. While not everyone can work in this format, games do provide ample opportunities to introduce art forms which might be more accessible in your setting. 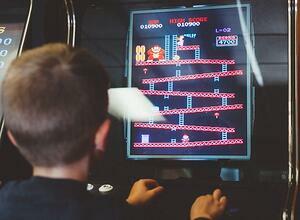 The Royal Philharmonic Orchestra have praised videogames for introducing many young people to classical music. Classic FM even broadcast a show dedicated to games music, High Score, presented by Jessica Curry who has won awards for her music in games like Dear Esther and Everybody's Gone to the Rapture. Videogame photography is growing in popularity, pioneered on sites like Dead End Thrills and with many new games now offering a photo mode, players can experiment like they would with a regular camera. For example, Assassin’s Creed series have recently included a mode which provides tours around accurate recreations of historical sites such as Egypt’s Great Pyramid, minus any combat or side missions. 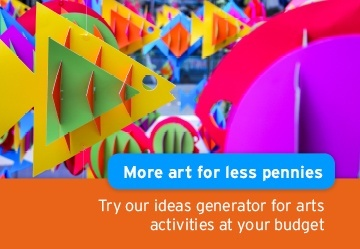 Options like this could link to museum trips or let young people consider other design elements without being distracted. We’ve touched upon apps already, but it’s worth stressing as a separate point that anyone with a smartphone or tablet has access to a huge library of creative tools. In your pocket is a resource full of potential. It’s a camera, editing suite, musical instrument, gallery, cinema, concert hall, canvas… And in many cases the apps which open up this world are bundled already or available for free. 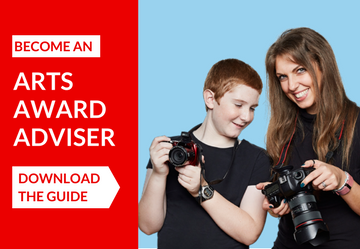 When working with young people it can be tempting to discourage the use of phones or ban them outright but in the right environment they offer a cost-effective, flexible and familiar gateway into the arts – digital or otherwise! Technology can’t only be used for creating art but also for sharing it! You could host files on Dropbox or Google Drive and send them to individuals. Or why not create a website for free using Wordpress? You can also put out audio and video content through YouTube or Soundcloud. 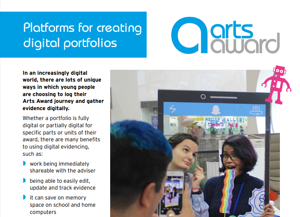 We’ve seen lots of examples of Arts Award taking advantage of technology in this way, presenting portfolios entirely online or using websites to share reviews and projects, and some of these are highlighted on our digital portfolio resource. As technology advances it brings more exciting possibilities for the arts and education. The points above focus on familiar, or more easily accessible, routes into digital arts but as technology is providing so much scope for unique creativity, we can’t wait to see what emerges!